We got two major primaries here on both sides, so this is going to be interesting. Joe Hune running for State Senate eliminated a chance of my next congressman being from my county. The Rochester area will have our nominee. Barnett is the Rochester Hills Mayor and has a lot of Oakland County establishment support. Mike Bishop has Mike Rogers support and opened up an office in Livingston County. Tom McMillin has a lot of tea party and libertarian support.While Oakland will have our next nominee, the road to run runs through Livingston County. On the dem side, Schertzing was recruited by the dem establishment. They wanted Whitmer or Byrum, but both declined. The other three candidates for them are sacrificial lambs. Note - Rochester Hills renamed precincts between 08 and 12 so I’m estimating 04 and 08. This district is a swing district that is a battle of the strongholds. It combines the 4th most democrat county in the state with the 3rd or 4th most republican county in the state and some of the most republican part of Oakland County. The keys here are to win your areas big and reduce the margins in the other base. It’s a Captain Obvious statement, but it is easier said than done. Base problems here can destroy your chances, as can alienating the swing voters. Mike Rogers does a good job at striking that balance. He’s actually won Ingham County in the past, even once winning Lansing itself. He also runs ahead of everyone in Livingston County. Ingham County is usually the 4th most democrat county in the state behind Genesee, Washtenaw, and Wayne Counties in that order. Kerry won it with 57.78% and by 22143 votes. Obama in 08 with 65.86% and 47511 votes, and Obama in 2012 with 63.43% and 35541 votes. In 2004, Ingham was 36.88% of the district vote. In 08, it was 37.54% of the vote. In 2012, it was 35.54% of the vote. Key base areas for the dems here are Lansing, Lansing Township, East Lansing, and Meridian Township (Okemos and Haslett) Lansing and Meridian Township alone make up about ½ of the county voters. Lansing is a mix of UAW, government related workers, minorities, and college students (MSU, Cooley, LCC). Lansing Township has historically been more auto-related in one part, and MSU related on the other. East Lansing is MSU and also government workers commuting to Lansing. It is usually the most democrat part of the district, although Lansing was this election. 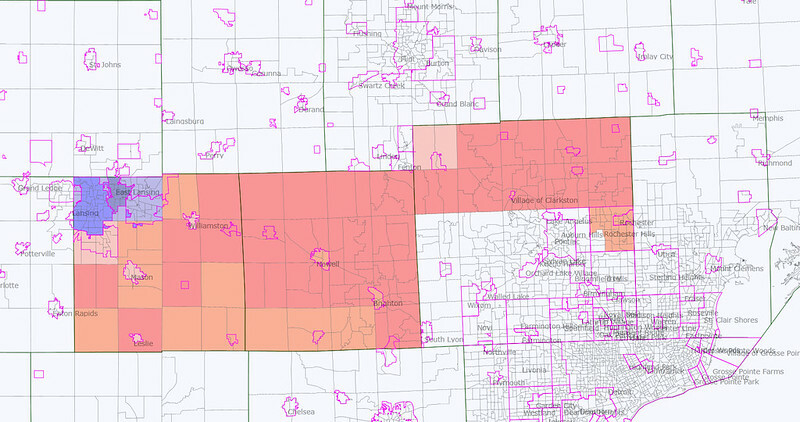 Meridian Township to the east of East Lansing is where a lot of MSU professors life, as do some students. The vote deficits we had to make up with those four places alone are as follows - 35839 in 2012, 45528 in 2008, and 27047 in 2004. That’s not easy to do. There’s four swing areas in this county that are key. Delhi Twp (Holt), Mason, Leslie, and Williamston. They are all areas with a lot of Lansing commuters and can be won by either side. Bush won them all in 04. Obama won them all twice. In an open seat for this district – if the R’s win all of them, this district is safe. If all of them are lost, it’s going to be a nervous night. The Southern and Eastern outer portions of the county often lean R, but not always. The Byrums are from Onondaga, own a store in Stockbridge, and run ahead of the ticket. That area is independent, and a bad showing there (like 08) makes things very scary district wide. If we keep the dems under 60%, we have the district. If we keep them under 57%, we have good chance winning statewide. East of there is my home. Livingston County. This county is highly educated, strongly conservative, pro-business, and is distrustful of big city politics. Being an hour or less from Detroit, Flint, Lansing, or Ann Arbor, that’s to be expected. By Oakland County or Ann Arbor standards, this is “past civilization.” We like it that way. There’s a strong 2nd Amendment , tea party, libertarian, and pro-life movement here, but there are also more pro-choice republicans than one would expect in a county where RTL is very strong. This area wasn’t as social conservative in the 90’s. The MEA is also fairly strong here considering how Republican this county is. The magic number for us percentage wise is about 63%. If we break 63%, we have a good chance of winning statewide. If we’re under 60%, it’s going to be bad. Mike Rogers always runs extremely well here. In bad years or bad candidates, R’s are sometimes held to 53-55%. McCain was held to 55.79%. In 04, Livingston’s 62.90% and 24969 vote spread was able to counterpunch Ingham County on its own. 08 was a whooping. McCain barely made a dent in Ingham’s vote spread. 2012 was a recovery of sorts as Romney set the highwater mark for raw votes and got the percentage up to 61.10%. That’s better than Bush 2000 and McCain. That still isn’t good enough. It made a good dent in Ingham’s spread, but not enough. There’s no real dem base here enough to cause a threat without special circumstances. Candidate quality is always key and can change things, but generic R always smashes generic D here 60-40 in normal November elections. Dems have some strength in nonpartisan races here, and are strong in small pockets of the county (a handful of precincts they sometime win). Usually it’s either places with apartment complexes and/or where a lot of teachers live. The MEA is the base of the dems in these parts. In our worst years, Brighton, Howell, Putnam Twp, Unadilla Twp, and maybe Hamburg Twp can flip narrowly. Usually they are around the 54/55% R range. In good years, those same areas can go for close to 60% R Most of the county is blood red, less so in the incorporated cities, and less so near the Washtenaw County line. Down the road, who knows? Nobody saw Oakland County going for democrats back in 1984. Livingston County is still growing, and it is our job to educate new residents why this is a great place to live, and part of that is due to our longtime local conservative and republican leadership. Do we have threats on the horizon? Absolutely. Novi’s six miles from the county line and used to be as Republican as we are. Now it’s 50/50. I’m not taking anything for granted. East of here is Oakland County. While Oakland is purplish to blue overall, this part of Oakland County is not much different than Livingston County in its voting behavior. Holly is competitive, but that’s about it. A lot of these areas vote about 60%R. Rochester and Rochester Hills are causes for concern with migration however. Independence Township is blood red and a base area. 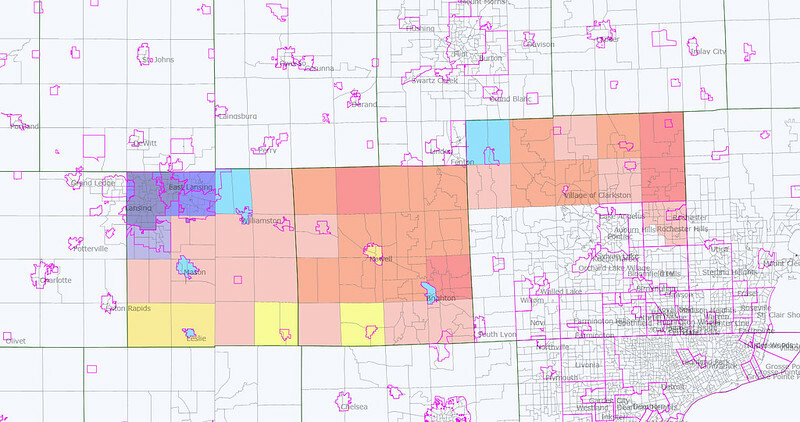 Most of this area is base republican and some of it is even rural which isn’t what one expects in Oakland County. This is much of the R base in Oakland County. This is mainstream conservative country, much like Livingston County. 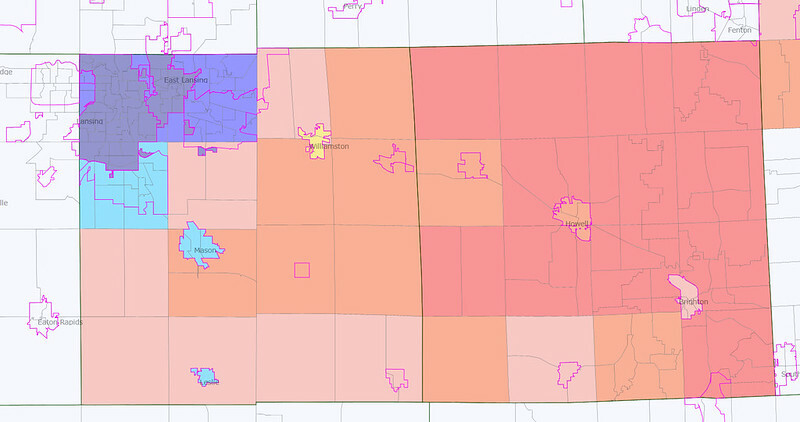 Overall this district is largely heavily blue or red. There isn’t a lot of in-between. Mike Rogers wins big because he keeps his base, racks up large margins in Livingston and North Oakland, and does respectable (sometimes winning) in Ingham County. He even won Meridian Township last election, along with all the swing areas like Delhi Twp and Mason. That’s the blueprint for making this a “safe” district for an incumbent. Is there a way the dems can take this district? Yes. Holding the R’s to 55% in Livingston and 54% in Oakland, while racking up big margins in Ingham County as in 2008 will do that. Could that happen again? Yes, with poor candidate quality. That’s our challenge if Mike Rogers runs for Senate.